The last three months of this year are shaping up to be a busy time for one Joseph Gordon Levitt. The 34 year old actor will in October star in The Walk and in December he will portray none other than Edward Snowden in Oliver Stone’s Snowden. However in November, Gordon Levitt will star in a new Christmas comedy The Night Before which has just released it’s first trailer. The first trailer tells us the story of 3 childhood friends played by Gordon Levitt, Seth Rogen and Anthony Mackie who all reunite in NYC. In the Beginning a scene is shown in a toy store that pays homage to 1988’s memorable piano scene in Big, but this time the trio plays Kanye West‘s “Runaway“. We then cut to scenes showing how the three have very different lives from each other but still remain friends. 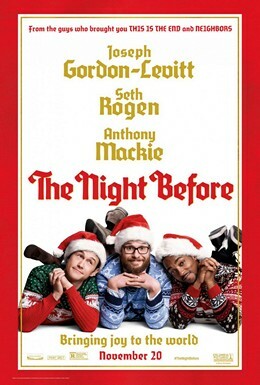 Gordon Levitt’s character Ethan gets his boys tickets to a christmas party and tons of hilarity ensues. Everything from Wu Tang Lyrics being spewed by JGL, Seth Rogen’s Issac throwing up in church a hilarious ride in a redbull limo and more, all the while the guys reflect on the fact their lives are changing. The movie is directed by Jonathan Levine and also starring in the picture are Jillian Bell, Lizzy Caplan, Mindy Kalling, Kanye West and as shown in the trailer Miley Cyrus. Evan Goldberg, Seth Rogen and James Weaver will produce and the movie officially hits theaters November 25th. Scroll Down to check out the trailer.